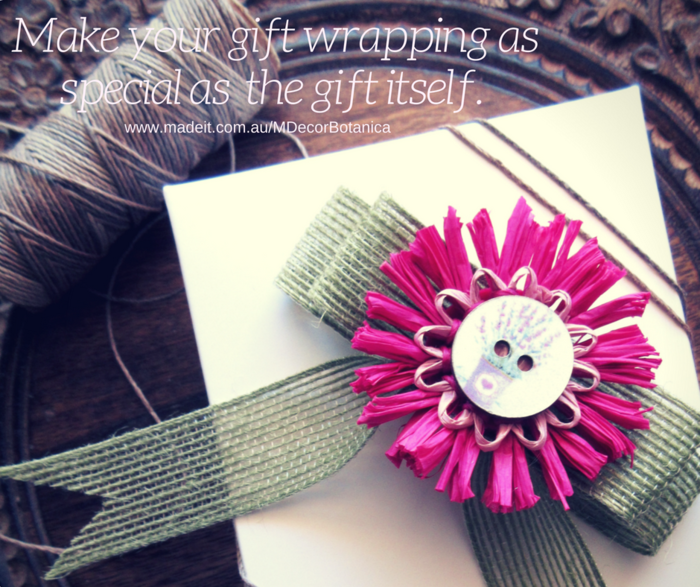 Give your gifts, projects or home decor an extra special touch with pre-tied eco-friendly jute bows. 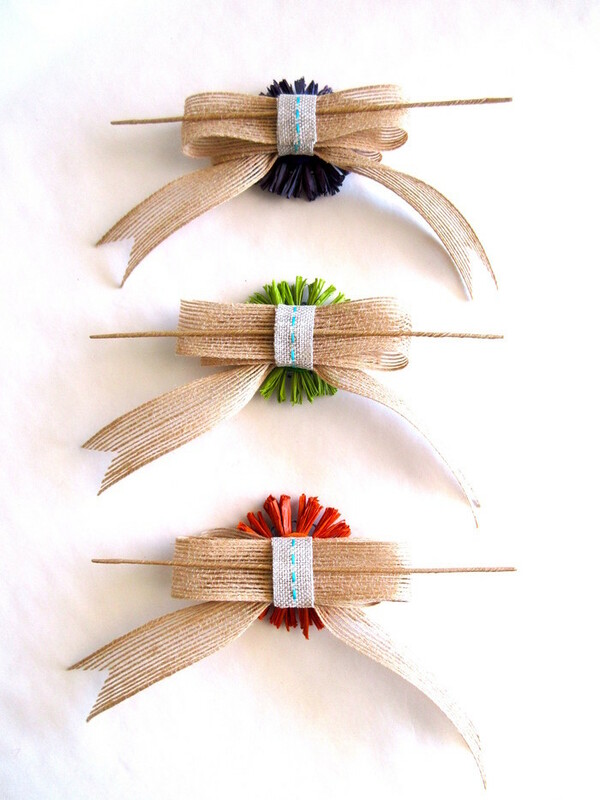 Whether you are wrapping a gift, creating home decorations, making floral arrangements or decorating for an event, these lovely jute bows with cute raffia blossoms will be a great addition to your decorating projects. 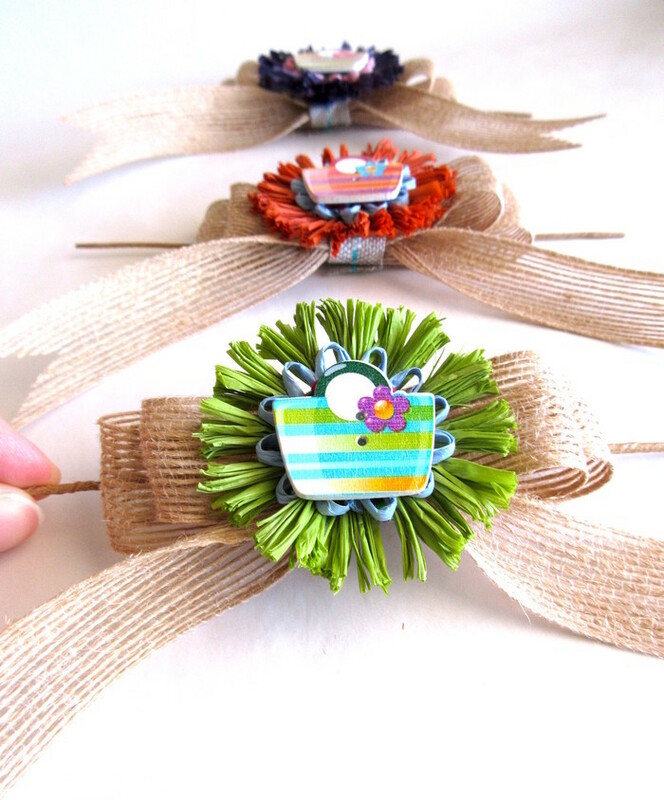 This listing is for 3 jute bows with raffia blossoms (picture no. 2). Examples of use are shown in picture no. 4, 5 and 6. They are ready to use. They are so very versatile! Beautiful accent bows for gifts, favour bags/boxes, hampers, baskets, bottles, vases, mason jars, wreaths, small floral arrangements, pots, picture/wood frames, mirrors…..the options are endless! 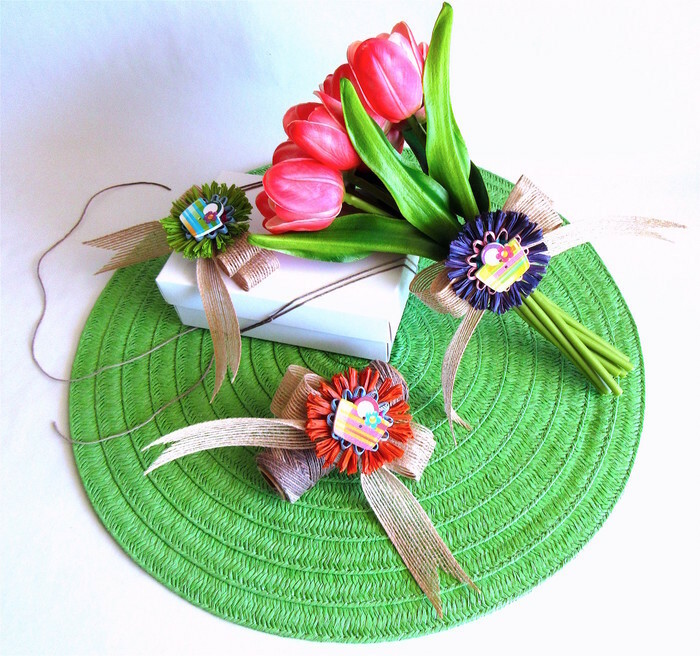 Each jute bow comes with a florist wire (wrapped with florist tape) at the back of the bow for easy attachment to any gifts or other products. The jute bow has double loops tied loosely as it gives you the option to adjust the loops and perfect overall look of the bow if you prefer to string your favourite ribbon/twine (maximum recommended ribbon width 20 mm) through the back of the bow while tying the ribbon/twine around the gift box or other products. Each blossom is handcrafted from high quality Madagascan coloured raffia and paper raffia/twine, decorated with a bag shaped painted wooden button in the centre. The back is secured by stitching, glue and a piece of wool felt. 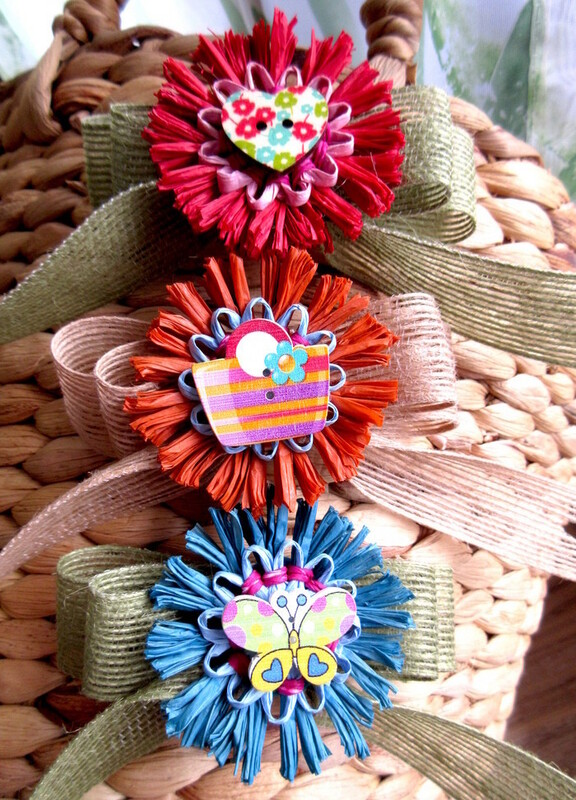 The blossom is attached to a natural style ribbon, wrapped around the double loops. coloured raffia (premium Madagascan raffia), paper raffia (100% paper - wooden cellulose), paper twine (100% cellulose), decorative bag shaped painted wooden buttons, natural jute ribbon, a natural style ribbon with a turquoise bold stitching (middle stitch weave), 100% Merino wool felt, glue. To properly care for your item, protect it from water, moisture and strong ultraviolet radiation (such as direct sunlight). Keep out of reach of children. The item is NOT A TOY, it is for decoration purposes only. If you wish to pick up your item in person, please use the code CAIRNSPICKUP at checkout (the postage cost will be eliminated from your order). Please be aware that the colour of the actual item may slightly differ from what you see on your monitor screen due to native differences in monitor calibration and settings. 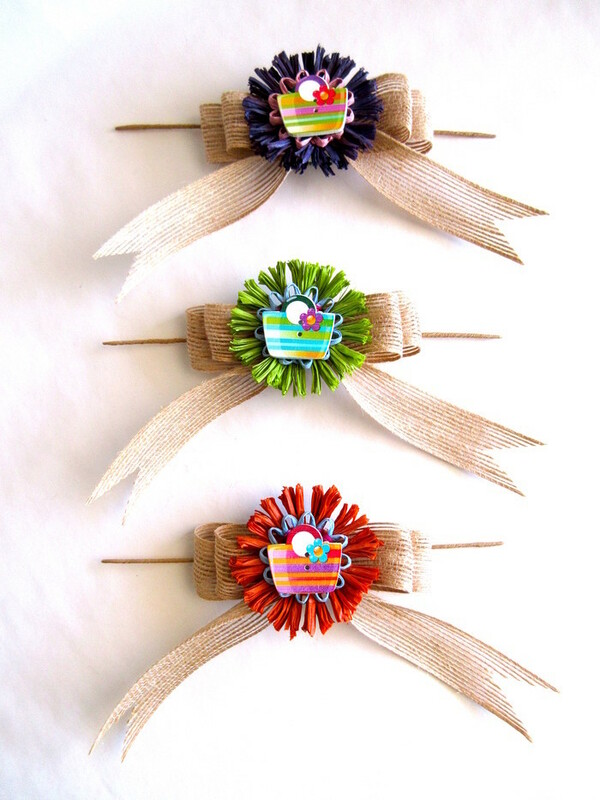 Due to the handmade nature of the items, there may be slight variances between each item. NEED HELP? HAVE A QUESTION? My store policies may give you answers to your questions. If you’re still unsure, feel free to send me a message. I endeavour to respond back to you within 24 hours. Please make sure your PAYPAL DELIVERY/SHIPPING ADDRESS is up to date. I will SEND your order TO PAYPAL ADDRESS (as the default address).